Members of the Border Search and Rescue Unit with the new Mercedes Sprinter ambulance they took delivery of in June. Border Search and Rescue Unit is drawing plans to move to a new base in a bid to respond faster to emergencies across the region. However, the land its current garage facility stands on is rented and does not provide enough space for all its associated equipment to be stored in one location. The building also lacks the necessary welfare facilities for its volunteers. In an effort to address those issues, an application has been submitted to Scottish Borders Council for a purpose-built unit at Kelso’s Pinnaclehill Industrial Estate, close to the Vermilion Dental Practice. A spokesperson for the unit said: “A purpose-built facility in the right location will allow us to respond quicker and more effectively to any callout, as well as hosting command and control of an appropriate incident. “Pinnaclehill Industrial Estate represents a sound location for a medical rescue base. The 1,900 sq yd site being eyed up as a potential new rescue base, north east of the dentist’s, is currently vacant. The unit was formed in 1963 to provide mountain rescue cover in the south east of Scotland, and all its members are volunteers living and working locally. The team is on call round the clock every day of the year, and last year members dealt with 19 incidents taking up 667 hours of their time. It also supports local events including common ridings, providing medical cover for rideouts at Duns, Kelso, Coldstream, Jedburgh and Edinburgh. In addition, its volunteers provided 531 hours of support during this year’s heavy snowfalls in the Borders caused by the storm dubbed the Beast from the East, assisting 80 people in the process. The unit has been looking for a new home for the last four years, having considered and ruled out eight other sites during that time. 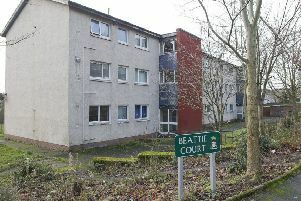 It expects the price-tag for its new base to come to around £300,000, but it has already secured a £35,000 grant from Scottish Borders Council’s localities bid fund to help it foot that bill. If its application is approved, it would hope to start work on its new home early next year.